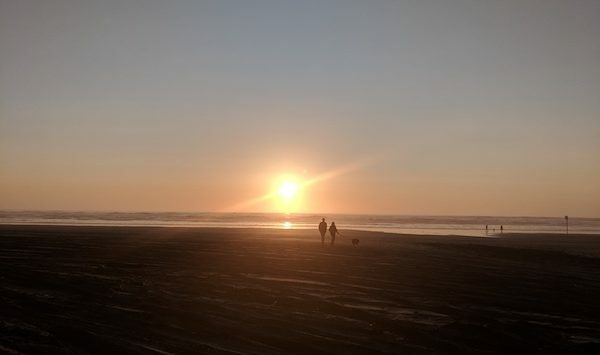 Over a beautiful spring weekend in March, I and my 11-year-old son went to the Long Beach Peninsula in Washington State. 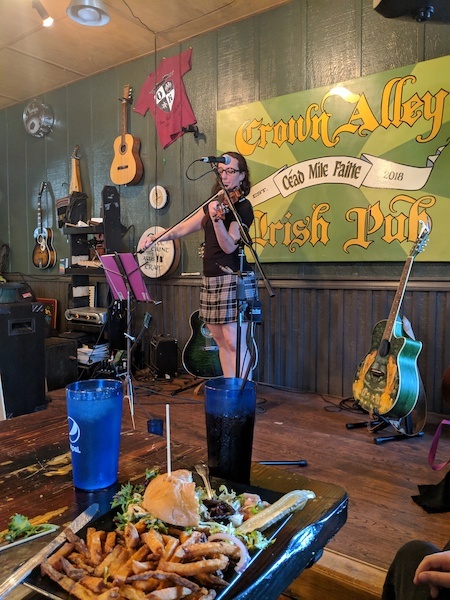 It also happened to be the weekend of the first annual Coastal Celtic Music Festival, held March 22 through 25, with tickets available for $30 to $100 depending on what access you wanted. In addition to seeing some of the best beach sunsets ever on the United State’s longest beach, it was such fun knowing that we would have incredible music to look forward to whenever we wanted to leave the beach. 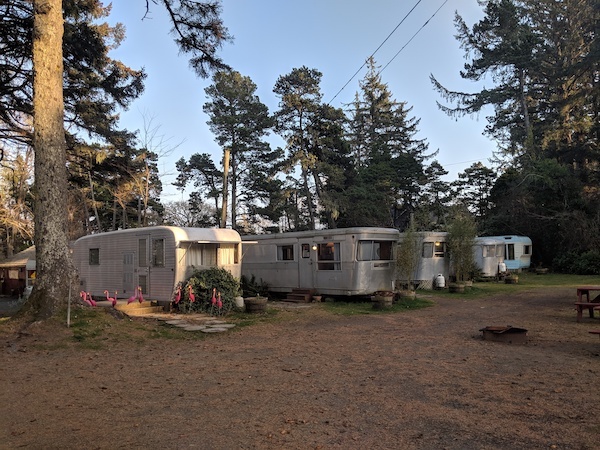 We stayed at The Sou’wester, a historic lodge and vintage travel trailer resort. 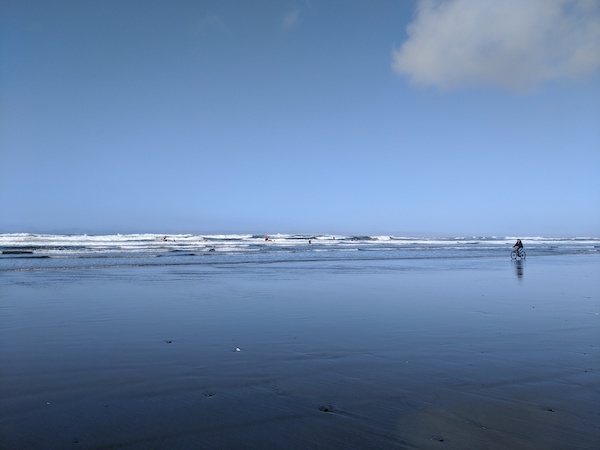 There were so many things to love about The Sou’wester, not the least of which was that it’s walking distance to Seaview, a beautiful beach just a safe 7-minute walk down the street. The Sou’wester is just down the street to the left, and the beach is just steps away. Going the other direction are several restaurants, which we enjoyed over our weekend. One of the neat things about the beach here is that the sand is strong enough to support vehicles, and it’s common to see cars and trucks driving right on the sand. This makes it easy to get to the perfect beach spot away from other people, and it also means this is a very good beach for visitors who may be disabled, because you can drive right down to the water’s edge. It’s easy to ride horses, drive trucks, or ride bicycles all along the water here. This weekend, the Coast Guard was practicing rescuing people with jet skis. We stayed in a Spartan camper with a pull-out couch and full-size bed in the bedroom. The camper had everything we needed for the weekend, including a kitchen with utensils, stove and fridge, and a bathroom with shower. The campers have record players in them, and inside the lodge is a community space with record albums you can check out. Our trailer was the middle one. Inside our trailer at the Sou’wester. 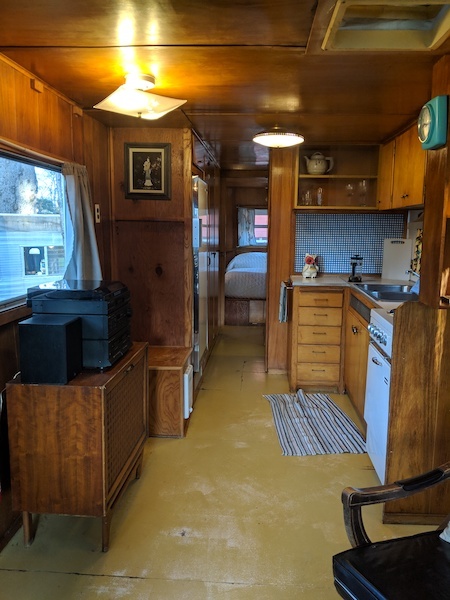 To complete the retro vibe is a library of VHS tapes and DVDs, and you can claim a portable TV and player to bring back to your trailer. Our camper had a French press coffee maker, but I forgot to bring my own coffee. Luckily the lodge has an honor system store for most of the things you might want or need: toothbrushes, coffee, soups, granola, cheese, kombucha, local beers, and things like that. Choices are local and organic for the most part. The Sou’wester was super cute and even more adorable than the website makes it out to be. They have a consignment trailer, where people have provided vintage clothes and other objets d’art for sale. There’s even an art gallery trailer with a changing exhibit. The lodge’s community room hosts music and other activities that change, such as the juice and smoothie bar that was happening on the weekend we were there. They also have a Finnish sauna. Guests can enjoy some fire pits in an area outside of the trailers, and it’s also common for people to build small fires on the beach—although if you do this you should be extra vigilant to not build fires close to the dune grass. 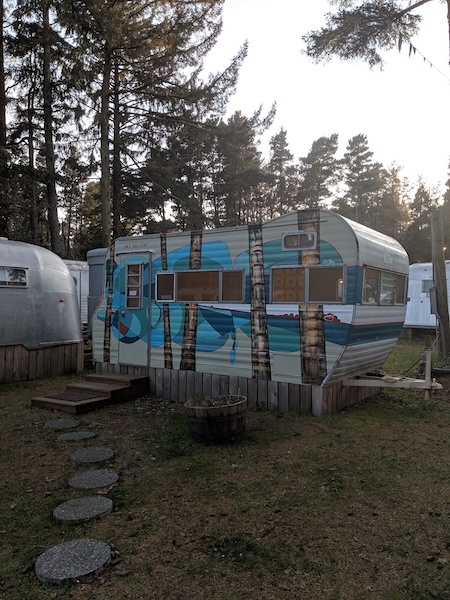 The art gallery trailer at the Sou’wester. The Crown Alley Irish Pub in Ocean Beach, was the epicenter of the Coastal Celtic Music Festival, which was taking place at various venues and at various times across the peninsula. Because the peninsula is 28-miles long, some things are fairly spread out. Seaview, where the Sou’wester is, is at one end and the Crown Alley is near the other end, so we planned out day’s activities around a morning at the beach near us, then getting to the Crown Alley for delicious burgers for lunch and to enjoy some music of the festival music, then heading back toward our end of the peninsula for dinner and sunset. It was at the Crown Alley where we picked up our cool badges to get us into the music, wherever we wanted to go, throughout the weekend. 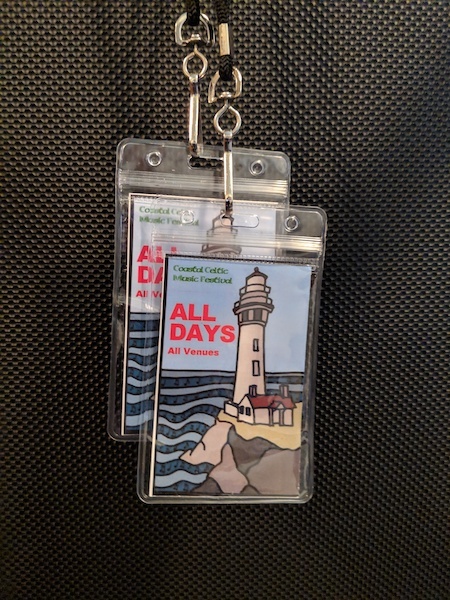 Coastal Celtic Music Festival badges. Annie Henry performing at the Crown Alley. We parked near the downtown area of the peninsula and walked around a bit. It was easy to find the Boardwalk. 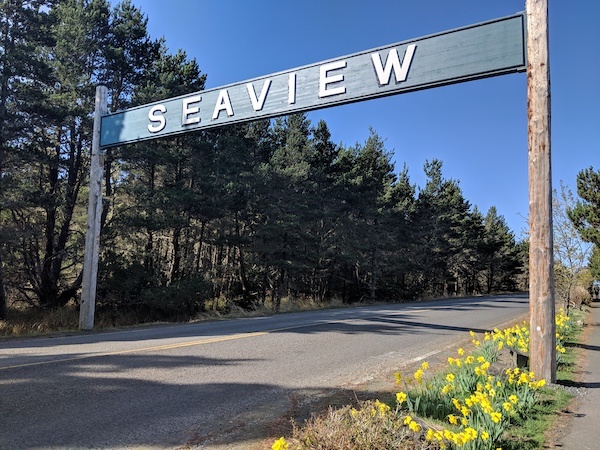 In fact, if you didn’t want to drive, it is possible to walk (or take The Sou’wester’s complimentary bikes) two or three miles and connect from the Discovery Trail boardwalk at Seaview to the boardwalk downtown and never have to drive at all. 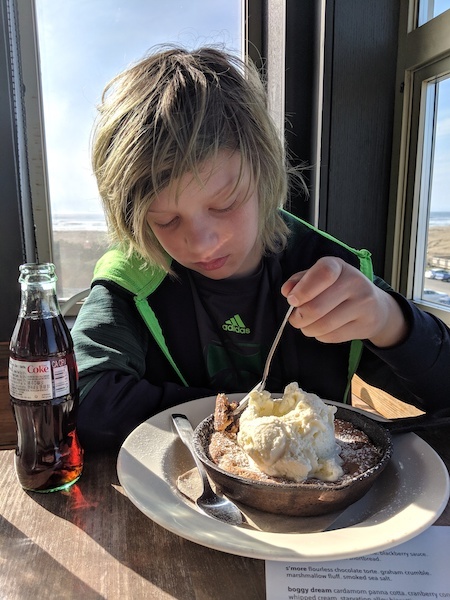 We took an afternoon break and enjoyed a warm-from-the-oven skillet cookie with vanilla ice cream at the Pickled Fish restaurant, where Celtic Festival music started in the evening. As you can see from the photo below, the Pickled fish is right on the beach, so even when you’re taking the time to eat you don’t have to miss out on the gorgeous ocean views. While we were eating, I was scanning the water for signs of migrating gray whales, which pass by this area every spring and fall, and enjoyed seeing a couple of blows. Warm skillet cookie with ice cream at The Pickled Fish. 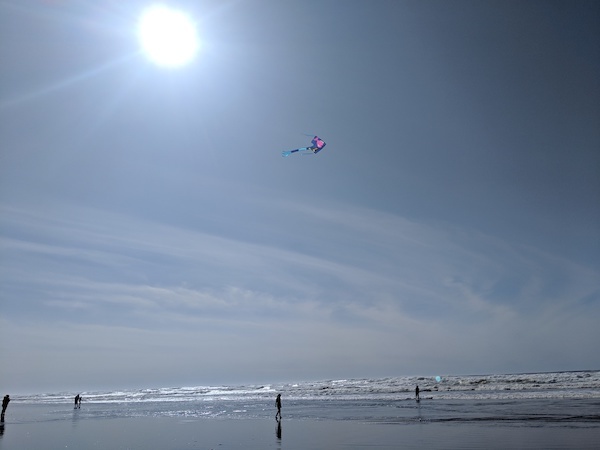 Kites are a huge thing on the peninsula, and there’s an annual international kite festival (held in August) and the World Kite Museum to prove it. The Pickled Fish is just steps away from the Kite Museum, making for an easy day. The beach here has a couple of picnic shelters, so you could easily grill up a hot dog lunch while watching the beach activity. Kites are always being flown all along the beach. This area has a rich history of Lewis and Clark’s Corps of Discovery’s 1804-06 expedition. The explorers reached the Pacific Ocean in Astoria, Oregon, just across the border. Cape Disappointment, Washington, so named when explorer John Meares failed to cross the river bar in 1788, is a public recreation area located southwest of Ilwaco, Washington, on the bottom end of Long Beach Peninsula. Here, the mighty Columbia River meets the Pacific Ocean and there is much to see. 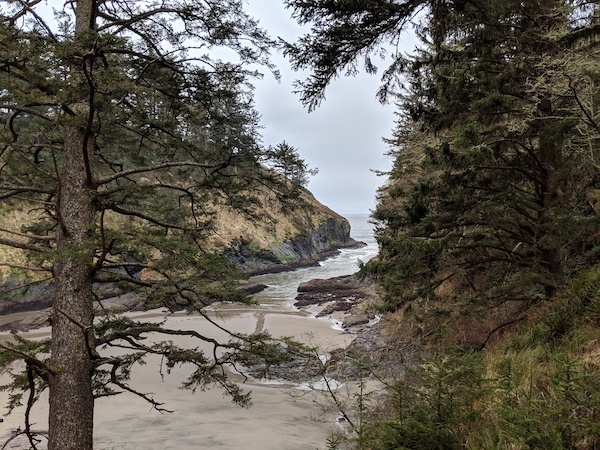 A secluded beach accessible from the lighthouse trail from the Lewis and Clark Discovery Center. The state park’s 2,023 acres contains old-growth forest, lakes and, of course, dramatic ocean views at every turn. 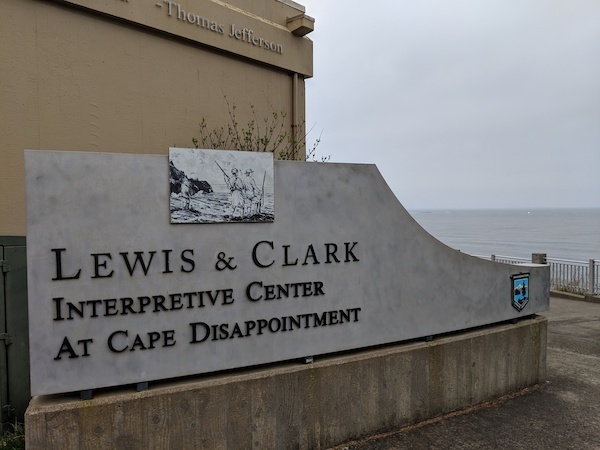 We visited the Lewis and Clark Interpretive Center, which is a short .6 mile walk to the Cape Disappointment Lighthouse. The Cape Disappointment Lighthouse was completed in 1856, and is the oldest functioning lighthouse on the West Coast. 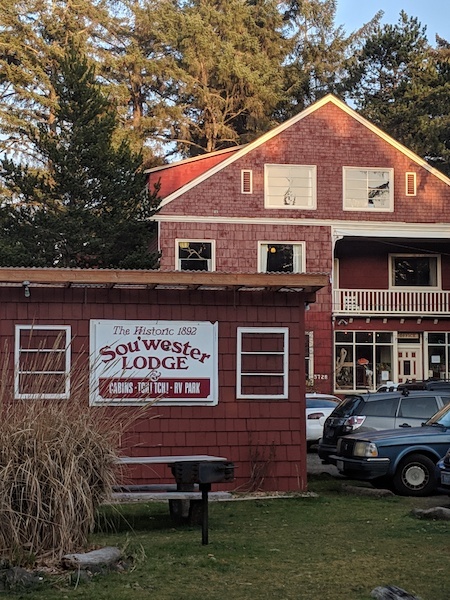 After this fabulous day, we ate dinner at The Depot Restaurant which is just literally a couple of minutes from the Sou’Wester lodge, and is housed in the train station platform dating back originally to 1888. There, Chef Michael Lalewicz uses the finest Northwest ingredients to deliver delicious, technique-driven dishes like the quail stuffed with housemade boar sausage that my son got—which allowed us to have fun joking about the world’s smallest drumsticks—and the delightful scallops with a spicy mango sauce, pickled red onion, and basil oil that I got. If you’re sitting at a table near the kitchen, Chef Michael might pop his head out of the open doorway and talk to you about your meal. 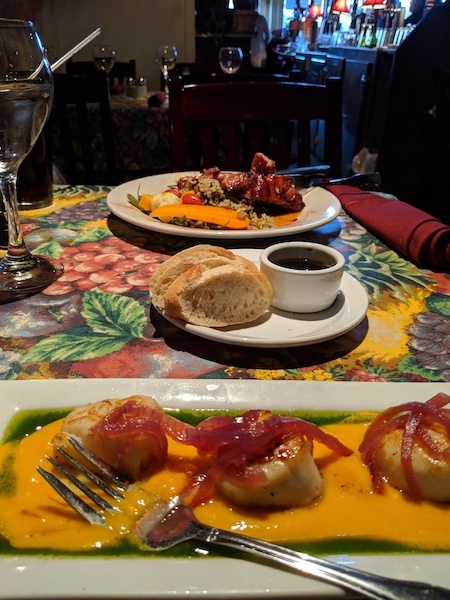 Delicious dinner of scallops in spicy mango sauce and quail stuffed with housemade boar sausage from the Depot Restaurant. My family and I were impressed with everything we experienced in the Long Beach Peninsula and we’ll definitely be back. From the 28 miles of stunning beaches, to the delicious dining options, and the memorable lodging at the Sou’wester, there’s a lot to love about Long Beach. Next Article Trying to Plan a Trip to Bali? Consider These Helpful Tips!